Mental illness can extract a heavy toll – both human and economic. Serious mental health issues cost Australian businesses a staggering $10.9 billion annually in absenteeism, reduced productivity and compensation claims. Since 2009, the date of 13 September has been dedicated to this cause, thanks to R U OK Day. It’s a national day of action dedicated to reminding each of us to ask family, friends and colleagues the question, "Are you okay?" Why? Because connecting regularly and with meaning is one thing everyone can do to support anyone struggling with mental health. The principle behind this day of awareness is ‘a conversation can change a life.’ We don't need to be an expert – just a good friend and a great listener. Deputy CEO of national charity, SANE Australia, Dr Michelle Blanchard emphasises how conversations about mental health should not just be restricted to 13 September. To keep that conversation going, there are also other steps you can take – which is crucial given mental health affects one in every two people. “One of the best things we can do at work to support each other’s wellbeing is to keep an eye out for our colleagues and offer support where we can,” says Michelle. 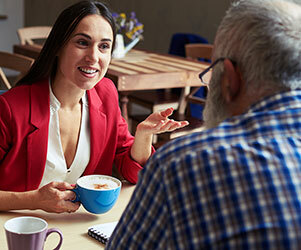 “If you notice someone is behaving differently – for example, they may be quieter than usual or appear agitated – don’t be afraid to ask them how they’re going and support them to reach out for professional support if they need it. Mental health issues can also arise in the workplace where people are exposed to trauma, work in roles where they have little control or have very demanding responsibilities, Michelle adds. “We also shouldn’t forget carers,” she points out. "A lot of them experience high stress, anxiety and other mental health problems associated with their caring role.” Many carers also have ‘lived experience’ of mental illness, and workplace stress may exacerbate stress associated with the duties of caring. Have upfront conversations about how you want to work together, what the signs might be if someone isn’t feeling great and how they might want you to help them. Encourage self-care – a walk in the park at lunchtime, or an afternoon off if someone has been working long hours. Be open to encourage an environment where people feel comfortable to raise concerns if they have them. Choose the right time for the conversation, ensuring you both have enough time and space to talk uninterrupted. Choose a safe, confidential space to meet. Don’t jump to solutions. People want to feel heard and respected. Don’t be afraid of silence. Sometimes it can be hard for someone to find the words to express how they’re feeling; give them time. Encourage the person to seek professional guidance and support. You may find it’s useful to offer to accompany them with when seeking assistance. Remember to regularly check in to see how the person is after the initial conversation. WorkSafe Victoria’s ‘WorkWell Toolkit’ is an online hub providing research, tools and information to support a mentally healthy workplace. Find out how to apply the toolkit’s resources to your business. SANE Online Forums provide a safe, free and anonymous 24/7 online platform for connection and support. If you or someone who know needs urgent help, call Lifeline on 13 11 14. The R U OK? website includes important information, including advice on how to start a conversation.